This is just one of the facts revealed in a new African Development Bank (AfDB) report, titled Tracking Africa’s Progress in Figures. 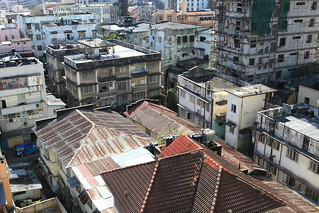 The report describes urbanisation as “a pan-African phenomenon”. It is estimated that between 1960 and 2011, Africa’s urban population rose from 19% to 39%. By 2040 it is expected that 50% of Africans will live in urban areas. Drawing from UN-Habitat numbers, the report also identifies some of the continent’s fastest growing cities. While the accuracy of some of these figures can be questioned (for example, many believe the population of Lagos is already close to 20m), it still provides for interesting reading. Tanzania’s commercial hub Dar es Salaam is listed as the African city that will experience the most growth between 2010 and 2025, followed by Nairobi (Kenya), Kinshasa (DRC), Luanda (Angola) and Addis Ababa (Ethiopia). Posted on 14th May 2014 by newsafrica. This entry was posted in Africa, Headlines, Human Development, Tanzania, War on Poverty and tagged Addis Ababa, Africa, African Development Bank, Dar es Salaam, Democratic Republic of the Congo, Kinshasa, Nairobi, Tanzania. Bookmark the permalink.